I have a clock that looks to be hand carved and I can't seem to find anything on it. I found a name J. Mortifee Blagdon and i see that it has Westminster chimes. I can't seem to find any info on it. I cannot find the specific maker, but Blagdon is a village in England and that is where your clock was made. I think it is from around 1850. It is probably and eight day clock which are more wanted than the 30 hour models. There were many, many small makers in England. 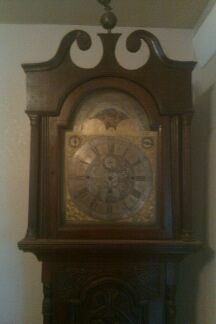 It looks to have a moon phase and some extra dials which give it a better value. Some rarer makers are worth quite quite a bit.